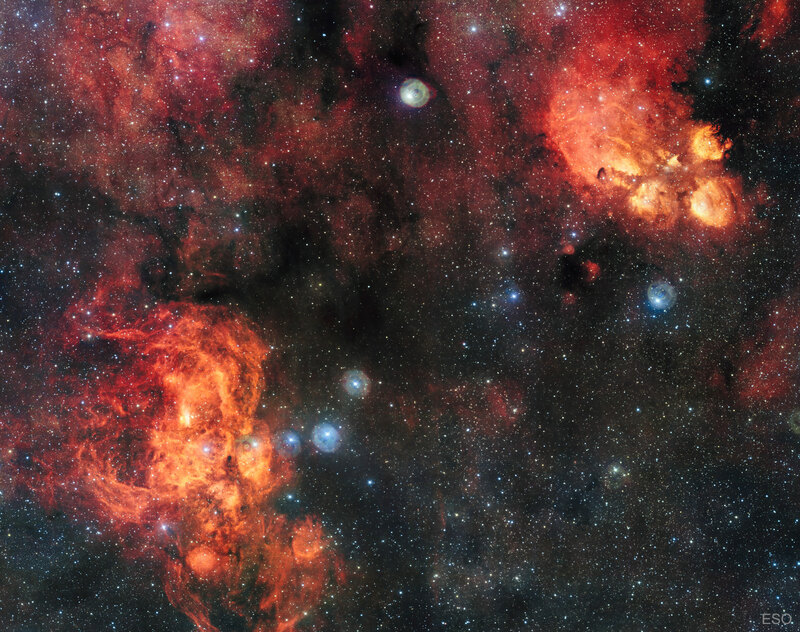 Explanation: Why is the Lobster Nebula forming some of the most massive stars known? No one is yet sure. Near the more obvious Cat's Paw nebula on the upper right, the Lobster Nebula, on the lower left and catalogued as NGC 6357, houses the open star cluster Pismis 24, home to these tremendously bright and blue stars. The overall red glow near the inner star forming region results from the emission of ionized hydrogen gas. The surrounding nebula, featured here, holds a complex tapestry of gas, dark dust, stars still forming, and newly born stars. The intricate patterns are caused by complex interactions between interstellar winds, radiation pressures, magnetic fields, and gravity. The full zoomable version of this image contains about two billion pixels, making it one of the largest space images ever released. NGC 6357 spans about 400 light years and lies about 8,000 light years away toward the constellation of the Scorpion.